Licia Albanese Interview with Bruce Duffie . . . . . .
During her illustrious career, Licia Albanese was one of the most well-known and beloved artists. She sang with Toscanini, and had her own radio program for awhile. Her years at the Metropolitan Opera included quite a number of Saturday afternoon broadcasts. At the bottom of this page are two brief biographical sketches. Along with some duplication of information, each has its own unique references, so rather than try to combine them, I have simply posted them as found elsewhere on the internet. Besides my own radio work in Chicago, I also contributed interviews to several journals, include Wagner News, The Opera Journal, and the Massenet Newsletter. It was for this French-oriented one that I contacted Mme. Albanese early in 1988. Though we spoke of the two settings of the Manon story (Massenet and Puccini), we also talked of other aspects of her renowned repertoire. The role-specific portions were published the following year, and a decade later I was able to use another portion on the air when presenting one of her complete operas. Now the entire encounter has been transcribed and is presented on this website. As I type, she is about to celebrate her 99th birthday, and it is fitting that we pay tribute to her as she enters her centennial year. When we spoke, her English was heavily accented by her native Italian, but she made herself very clear about every idea. Sometimes her sentences were choppy or incomplete, and I have left a few of those patterns intact in this transcript. They gave a sense of urgency to her thoughts, and this came through quite often as we spoke. Here is that conversation . . . . . .
Bruce Duffie: Thank you so very much for speaking with me. Licia Albanese: Too bad I couldn't come in Chicago! I would be really very happy to be there! BD: You sang in Chicago a number of years ago. Tell me about your recollections of being here. BD: Tell me the secret of singing Puccini. LA: Why do you ask me this? Is it difficult to sing Puccini? BD: Is it difficult? More difficult than Verdi? LA: No, that's why you asked me! LA: I heard from so many sopranos said that Puccini's very difficult to sing, but I don't think so. BD: It was not difficult for you. LA: No. Not difficult for me, but then I was a lyric soprano, and these are mostly for lyric voices. I was very pleased, and it was too bad I couldn't sing more of Verdi's dramatic operas, which I adore. I could sing only Nannetta in Falstaff, and Desdemona, and La traviata. I also sang La Messa da Requiem in California. BD: With so many beautiful roles to choose from, how did you decide which roles you would sing and which roles you would decline? LA: I have to look at the role. Even maestro Merola asked me to sing Tosca. I said, "Let's wait a little more for Tosca. She's very, very dramatic in action, not vocally because if you have high notes, the second act's okay. If you don't have it you scream, and that's terrible. [Laughter] The most dramatic thing is in the duet with Scarpia, and it is dramatic even to the last touch, and later to describe again what she did with Scarpia when she killed him. Usually they don't make all the same reactions like they did in second act. When you see a movie and then somebody tells you the story, they come in and tell you what happened. So I used to do that the last act of Tosca this way. I did the same staging, the same movements I did when I killed Scarpia to show Mario what I did. That becomes dramatic, too. But I think the dramatic comes when you really not just push the voice, because then the voice stops; it doesn't go on to the audience. It isn't just to have this kind of beautiful shining voice; it must project. We had so many artists that had voices that were smaller than mine — Schipa, for example, or Cesare Valletti, or Gigli. They were lyric. Cesare Valletti and Schipa were leggiero, light, and you could hear those voices even at the back of the opera. That means they never pushed; they just left the voice floating. That's what I tell to the young people when I see them, "Why don't you make your voice float in the theater?" Not to do [vocalizes in a coarse, constricted, and unsophisticatedly undulating tone] "Uhhhhhh," where you push and you keep the breath in the back. Instead, the breath should come out. You need to do [demonstrates singing in a light, relaxed tone of voice] "Ahhhhh." [Demonstrates the same thing, starting more softly and gradually increasing in volume] "Ahhhhhhhhhhhhh." This goes because the note is on the breath. I don't see them because I don't teach; I try to teach, but I couldn't. I want to be free. I need to do a lot of things. I don't know if you heard, I sang the Follies here in New York two years ago, and then I sang it in Houston for a month. I was there the month of June, and they enjoyed it so much. BD: In the operatic performance, where is the balance between the music and the drama? BD: Which is more important, then, the actual vocal singing or the dramatic effect? LA: Well, both! If you do dramatic effect, and then you ruin the voice, it's not good even when you cry! The voice should be firm. That's why I have to look, and then they say, "Put expression, but don't ruin the voice." Even Toscanini used to say that. We learned this in Italy from all the great old artists. For every action, if you forget your singing the voice goes on the floor. When you do something, sometimes when they sing they forget they're singing. They move their hands or put their hands very straight or they are very nervous and they go here, they go there. Women kick their long trains out of the way. I say, "Don't do that. That's not good. You must be natural in everything you do." You have seen so many artists kick their trains. That's ridiculous! I saw great artists to do that. They should do that slowly and then turn around because sometimes it comes between your legs! You could fall down! But I never thought that they did it in a natural way. I love to act a lot. The more I can act, the more I love to sing! That's why I miss so much, in the opera, the dramatic Verdi operas. I miss so much action; there is so much drama in those artists. If I could sing La Forza del Destino I would do so many beautiful things, but the voice couldn't do it! I couldn't be such a soprano. When I started to sing with Toscanini at the beginning of my career, they would ask me to sing dramatic operas, but if you sing them, the orchestra would play so loud! So all the voice is missing, even a dramatic voice. In Turandot or Aïda, you don't hear the voice of the singers because the conductors don't have taste; they don't have restraint; they like to do symphony concerts. I said all the time to them, "You do symphony when you symphony, but when you do opera, you cover the artist." Even Toscanini used to say that. The music should be under the voice. Listen to Karajan. For Freni or all those people who are very lyric like me, he did a beautiful job with those beautiful voices, to allow them to sing dramatic operas. BD: Are we losing the great tradition amongst conductors? LA: Yes! You may be too young to remember, but that's the tradition! When they had singers, they put the orchestra properly down. I sang with Schipa many, many times. I started my career with Schipa and Gigli, and the orchestra was really very much under the singers. Even in the big theater you could hear them! They had such great voices, Schipa especially. He was a light, lyric tenor with a beautiful quality of voice and a great mezza voce. The conductors muted the orchestra very low, and then the public enjoyed those beautiful quality of voices. Now they put big singers even in roles like Lucia. I asked if Caruso could make the mezza voce, and Rosa Ponselle told me about this. She was a dramatic soprano, and I said, "Rosa, how could you sing Traviata with a mezza voce like this, just to show you're a sick woman? You cannot sing it like Aïda." She said, "You have to restrain the voice when you do certain operas which are not like Aïda or Forza del Destino or Norma." This is right because I used to sing with full voice in Traviata, though my voice was not too big! And in Butterfly, too! In the first act of Butterfly, I come in with a voice like a young girl! The great artists told us to sing in this way! Then you grow in the opera like you grow in life! In the second act she was a mother, and third act was a tragedy. For the Japanese, tragedy is tremendous — worse than Sicilian people. Oh, yes! Much worse! BD: So then you changed your vocal technique a little bit from opera to opera? LA: Yes!! Oh, yes. And Bohème, too. She is very frail. You cannot sing [imitates singing in a deep, booming, inappropriately heavy voice] "Mi chiamano Mimì," which I hear often. They ruin the character! They ruin the soul of Mimì. Toscanini said, "I want for Musetta a big voice. I want a lyrical singer for Musetta because Musetta is a healthy, healthy girl. BD: Did you change your technique at all from house to house, from a large house to a small house? LA: No, no, no. No! This is because the voice should be soft all the time. No, no, we never thought of this. Years ago we would not have to push if it is a big house. No! When I started to sing and when I came to this country, we really had different conductors. I don't want to say we don't have good conductors now, but they don't care for voices. That's what I think, because they are very good conductors. Now we see so many; they go, they come, I don't know what is the expectation in the opera. I was 22 years here at the Met and we had the same conductors. They were so nice with us. They tell us to sing mezza voce or pianissimo. When I did Traviata with the maestro — Toscanini — he said to Peerce and Merrill, [shouts] "Don't sing troppo forte! Don't you hear this woman is dying!" I said, "Maestro, please, can I sing a little forte myself?" On the microphone, is very difficult to sing pianissimo! And he said, [in a high, excited and impatient tone of voice] "No, no, no, I want you to do this. What are you singing, Gioconda?" I told him it was very difficult to maintain this, to sustain this very pianissimo, and he said, "In the theater it's easier because in the theater you give little more." When I was singing, I did a lot on television and on NBC radio. I had a program for ten years! So, the mezza voce had to be a piano or even pianissimo. But in the opera, no. In the opera you can leave just the balance more than with the microphones. When we make records with microphone, we cannot go far away or closer. We have to shape the voice. If you would do a low note pianissimo, you had to shape it with the microphone at the same distance. BD: Are you pleased with the recordings that you made over your career? LA: Yes, I'm pleased with a few, but I can criticize myself all the time, even my talking voice. [Laughs] I'm a great critic, and when I saw maestro Toscanini it was just the same. He was critical when he used to listen to his records. He always said, "No, this is not good, that's not good, the tempo is not right and this is not like that." He thinks just the same way I used to think. When you criticize yourself, you become somebody else. We never did the opera in the same way, musically or the staging, too. Opera is born free. When somebody is a good actor, we always changed things. We sing so many times Traviata, Bohème and Manon and Tosca. Every performance, they taught us to change position! To change acting! Even vocally we changed. BD: And this kept it fresh? LA: We did so many new things! That's what we left us us free with the stage director because they saw we had this great gift to be actors and actress — like Pinza, like Schipa, like Gigli. They left us free, and if somebody couldn't move or couldn't do this, then they took them in the room and they taught them how to do it. So that was opera. Now they put the chalk there on the floor and you have to put the point there. It is so dark you cannot even see. This is a mess! Really, it's a mess. My son asked, "Why is it so dark?" When we were young, we would see well. It is not like now. I put on my eyeglasses and I don't even see. BD: Do you feel that opera works well on the television? LA: Yes; you can see everything in television [chuckles] better than in the opera house! BD: Let me ask about a couple of roles. Tell me the differences and similarities between the two Manons — the Massenet and the Puccini. LA: First I read the book, if there is a book, of the opera that I always sing. When I did Donna Anna or Nozze di Figaro, we have books of these beautiful roles. With Manon, I read the book. I find the Manon of Massenet very French, elegant like a powder puff. [Chuckles] When I study the Puccini, Puccini was Puccini, dramatic and Italian. But I read the book and I found out very much. For instance, des Grieux was a very, very stubborn man! This is like a Sicilian mind, like where I come from in Southern Italy! Very, very stubborn. I find out the two operas had the same thing — light and then dramatic. In Manon of Massenet, you cannot put something dramatic like Puccini did in the last act with "Sola, perduta, abbandonata." This is a heavy, beautiful aria. That's the difference. The Massenet opera is very light, very chic, but both of them are beautiful. BD: Are they really two different sides of the same character, showing different personalities? LA: No; I don't think so. Personality aside, Manon of Massenet has to act like a French girl, but Manon of Puccini can act like an Italian. But you have to have the voice! The Puccini is more dramatic, but you have to have a light voice in the first act because she is a very young girl. In the second act she becomes coquette and she believes that she knows the world. For the death in the last act, in the finale they are both beautiful. Really I loved both of them, but you have to lighten the voice even in the Puccini when you sing the first act to be really very coquette. You have to imitate the French people. I don't think that I could sing the Puccini Manon like I sang Butterfly! When you sing Butterfly, you have to do it in a more Japanese way to become a little young girl. They don't do that now. They sing just Puccini and they put a dramatic voice in for both Manon and Butterfly — which doesn't require dramatic voice. A dramatic voice becomes heavy, and will lose the character of the personage. BD: Let me ask another balance question. In opera, where is the balance between art and entertainment? LA: Entertainment from the stage, to entertain the public? BD: Do you feel that there is a great artistic achievement, or do you feel that there is more entertainment value? LA: No, no. I think the opera is entertainment, but it is an elegant entertainment. Certainly you go to the opera you go to be entertained, no? [Chuckles] You go to enjoy the opera, to think about it, and it should be artistic. When you don't have that, if you are not really a beautiful artist to entertain the public, the public doesn't care anymore for opera. To put how to do this in an artistic way, when I used to go on stage, I always had in mind when, "Tonight the public must be mine." You have to do for them. I always thought I was a projector, to project on them in their heart and their soul. One man used to come back to hear me so many, many times, and I asked, "Why do you come to see me so many times in the same opera?" He said, "Because you change how to act, you change how to sing, you change costume, you change everything." That was what I saw at La Scala when I was a student — I saw those artists change every time saw the same operas! That was the way the opera was done! Pinza sang with me, and he never told me, "You go away from there, because that's my spot to come in." No! One night he was on one side, and another night he was elsewhere. With the tenors it was the same thing! We sang with Schipa in Rome and La Scala; we sang together every year for five years. He sang L'Arlesiana, Elisir of Love [sic], Don Pasquale, and then Lucia which I never sang with him because I never sang Lucia. Another opera I sang with him many times was Werther — I was Sofia. But he never said, "You are in my place; shouldn't be there," because we are taught to move, not to be in the same place. Never! Later, when we came to the Metropolitan with Mr. Bing, we got a little stuck! We got a little too stiff! When you sing, opera singers must be free on the stage. Like I told you before, if you are an actor, just go. They left us to do what we wanted, to do new things, to do this, to do that. Now you are not an artist, you are just a salami. [Both laugh] Today they say, "Now you have to do this, you have to do that." Sometimes I had to say to director, "Please, maestro, why don't you teach the tenor or baritone to do this?" He said, "You can never do this anything for their acting. I tried; I had him work with me in the room." They could never do anything. Sometimes, between us we used to talk about the positions on the stage. Pinza would say [in confidential tone of voice], "Tonight let's do something different," and I would say, "You do what you want, then I follow you." [Chuckles.] So we did. [Nostalgically] Back then we were was such a beautiful company, even on tour. We loved one another, respected one another; we admired one another so much, and I loved to see all these great artists on the stage. I used to go every night at the old Metropolitan. We had our box near the stage, and it was very interesting to see same opera I sang. I went to hear other people — to admire them, never to criticize. If I was going to do that staging, I was studying just by looking. BD: And you learned from these? LA: Yeah. In Italy I learned a lot of staging, too, because I had a private maestro for the drama. I would work on the words and then the music. Then we would work on acting — to sing in profile, to sing with your back, to sing in three-quarter as well as in the front. When I attend performances these days, I wonder if it us just me because they don't seem to reach the public! Sometimes I say to myself [in a welcoming tone of voice], "Come, sing for us here! It doesn't mean anything if you don't reach us!" This is true even if it was very nice. When the audience comes, we don't want them to say, "No, I didn't like it, and I'm not coming to the opera anymore." [Laughter] No, no, no. If you love music, you listen to many styles, like I do a lot with Wagner. I love the Wagner music very much but we don't have those great voices like we used to. You cannot forget those people. If you are young, you don't know the past. I know, and that's why I feel a little upset about it because I think the artists don't stop and restudy the opera. Every time sing the same opera you have to restudy it, go over it to find new things. You can always find things; you never stop studying, never stop. If you stop, you're finished and you don't become anything. BD: Is this what makes a great opera — that you can always find new things? LA: Yes. Absolutely. That's what they asked me, too, and that's what I ask all the great artists, "How can you do new things?" It happened to me every time; even on the stage something new came, and I did it! I always say you can do things on stage. You can sing with the head down, with legs up, or just lie down, but you have to know the opera so well, because if you do something new maybe you forget the words! BD: What other advice do you have for younger singers? LA: I tell young singers, "Don't sing under the music or under the notes. Don't think this is a high note, that's a low note; think of the words. Think what is the meaning of the words and then you go into the character. You never change the face! You have to keep the face, even when your companion sings. You have to do something to show you understand his words! You have to make some kind of movement, but not do too much while they are singing. Just something to say with the face that you are listening. But you need to know why did you change the face. Listen the music; just follow the music, even if you don't sing. In concert, for example, when the pianist plays, just follow the music. Don't stop because then the face becomes blank. You have to remember that the public should be interested in you at every moment. Even if you walk just one step, make sure it is on that music. One movement on that music; one turn of your body on that music. The music tells you how to be an actress. That's what the great conductors told us. If you move on the music, you become an actor or an actress." That is how I learned! BD: This has been a great pleasure to speak with you! Thank you so much, and thank you for all you have given the opera world. LA: [Apologetically] Too bad it is on the phone. It's much better to look at me, because when I talk I act, too! [Laughs] I hope to meet you sometime. When you come to New York you just call me. Good luck to you. Bye-bye . Italian soprano. Born July 22, 1913, in Bari, Italy; m. Joseph Gimma (Italian-American businessman), 1945; studied with Emanuel De Rosa in Bari and Giuseppina Baldassare-Tedeschi in Milan. 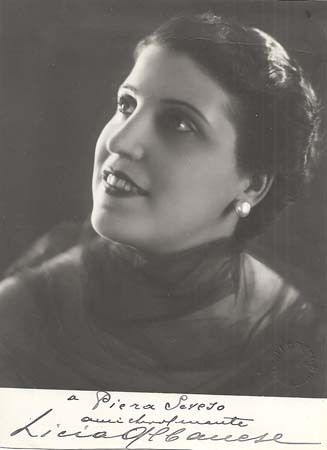 At 22, won 1st Italian government-sponsored vocal competition in a field of 300 entrants; in 1st five years of career, sang at Teatro alla Scala, Covent Garden, and the Rome Opera; when Benito Mussolini would no longer let distinguished Italian artists leave the country, escaped to Portugal (1939) and boarded ship bound for US; debuted at Metropolitan Opera (Feb 9, 1940) as Cio-Cio-San; was perhaps the most famous La Boheme Mimi of the 1940s; made final Metropolitan Opera performance (1966); received the Lady Grand Cross of the Equestrian Order of the Holy Sepulchre from Pope Pius XII; after retirement, worked for Puccini Foundation, founded by husband, to further survival of opera as art form; awarded President’s Medal by Bill Clinton for work in the arts (1995). 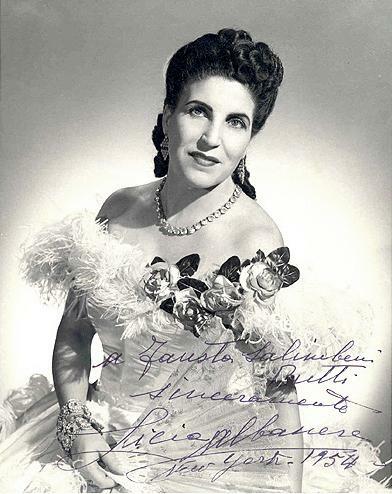 Albanese was one of the most beloved sopranos in the Italian repertoire, specializing in roles that suited her physical and vocal appearances of vulnerability and delicacy. She specialized in Puccini, and was associated with his Madama Butterfly more than with any other role. Her vocal and dramatic intensity and sense of apt staging made her performances riveting. She first studied piano, but switched her energies to voice, studying with Giuseppina Baldassare-Tedeschi. She won the Italian National Singing Competition in 1933, and her opera debut, as Butterfly, was as a mid-opera last-minute substitute for an ailing colleague at the Teatro Lirico in Milan, in 1934. Her La Scala debut was in 1935 as Lauretta in Puccini's Gianni Schicchi, her Covent Garden debut as Liu in Turandot, and her Met debut was in 1940 as Butterfly, beginning an association with that house that lasted until 1966. She made the occasional forays into heavier repertoire during her career, even experimenting with the role of Elsa in Lohengrin in her early years in Italy, but rarely added such roles to her repertoire, and being careful with her performances of even such medium-weight roles as Tosca. Towards the end of her career, she performed heavier roles such as Aida. 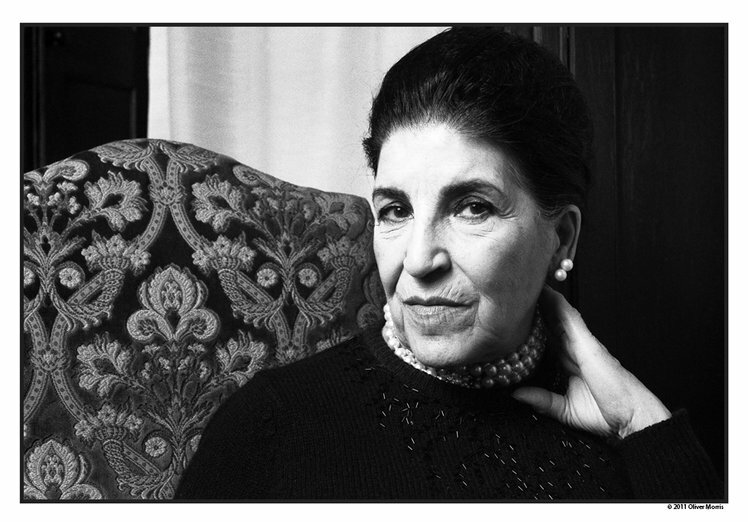 After her retirement, she remained active, leading the Puccini Foundation (which she and her husband created), teaching master classes at the Juilliard School of Music and Marymount Manhattan College, and directing operatic scenes. In 1985 and 1987, she made cameo appearances in Steven Sondheim's Follies. In 2000, she received the Handel Medallion. The honor, which was bestowed upon her by Mayor Rudolph W. Giuliani, is a tribute to individuals who have enriched New York City's cultural life. This interview was recorded on the telephone on February 26, 1988. A portion was published in The Massenet Newsletter in July, 1989, and other sections were used (along with recordings) on WNIB in 1998. It was fully transcribed, re-edited and posted on this website in 2012.